A Grob Prefect T1 of the type based at Barkston Heath. 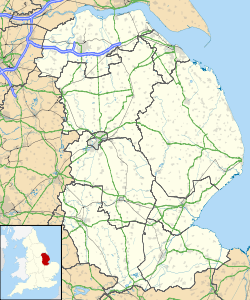 Royal Air Force Barkston Heath or RAF Barkston Heath (ICAO: EGYE) is a Royal Air Force station near Grantham, Lincolnshire, England. RAF Barkston Heath has the Naval and Army Elements of No. 3 Flying Training School RAF (3 FTS) which, for a period between approximately 1995-2010 operated the Slingsby T67M260 Firefly, followed by the Grob Tutor T.1 which operated between 2010-2018. 3 FTS currently provide elementary flying training for Royal Navy and Army Air Corps students on the Grob Prefect. A secondary role of RAF Barkston Heath is as a Relief Landing Ground for the flying training activities at RAF Cranwell. At the time of its construction, Barkston Heath was intended for use by the RAF's No. 7 Group, in common with a number of other airfields in the Grantham area. In late 1943, Barkston Heath was made available to the United States Army Air Force's Ninth Air Force. It was earmarked for basing troop carrier units scheduled to be transferred from Sicily to participate in the forthcoming cross-Channel invasion, Operation Overlord. During its time as a USAAF airfield, Barkston Heath was designated as USAAF station 483. The 61st TCG was part of the 52nd Troop Carrier Wing, IX Troop Carrier Command. The headquarters of the 61st Troop Carrier Group moved to an Advanced Landing Ground (ALG) at Abbeville (ALG B-92), France, on 13 March 1945, but its squadrons went to RAF Chipping Ongar from where they participated in Operation Varsity on 24 March carrying British paratroops who dropped near Wesel. An increased demand for theatre air transport brought the 349th TCG from Baer Field Indiana in late March 1945, with its Curtiss C-46 Commando transports. Group headquarters was established at Barkston on 30 March, but the group only remained three weeks before moving to Rove/Amy, France, on 18 April. The squadrons of the 349th TCG were coded as follows: the 23rd -08, 312th -9E, 313th -3F, and 314th -LY. It was assigned to the 52nd Troop Carrier Wing. In May, a detachment of C-46s from this group returned to airlift British 1st Airborne Division troops to Norway. The USAAF returned control of the airfield to the Air Ministry in June 1945 when the war in Europe ended. Barkston Heath was used by No. 256 Maintenance Unit RAF and No. 2 Squadron RAF Regiment. From May 1948 it was assigned to RAF Cranwell as a relief landing ground, and this role continues today. The airfield was also used during the 1980s by a number of privately owned aircraft of various types, and for several years it has also been the venue for the British National Model Aircraft Championships. From 1983 to 1989 Barkston was home to 'A' Flight 25 Squadron (with Bristol Bloodhound surface-to-air missiles) when they returned from RAF Bruggen in Germany. For a while Barkston was the home of Red Dragon flight delivering Prince Charles's basic flight training. A line-up of Slingsby T67 Firefly aircraft of the Defence Flying Training School at Barkston Heath in 2008. On 1 April 1995, the Joint Elementary Flying Training School (JEFTS), which provided training to RAF and Fleet Air Arm (FAA) pilots, relocated to Barkston Heath from RAF Topcliffe in North Yorkshire. The school was equipped with eighteen civilian registered Slingsby T67M Firefly trainer aircraft. In 1996 the Army Air Corps (AAC) joined JEFTS and the school operated as a tri-service organisation until 2003 when the RAF decided to instead provide elementary flying training through its network of University Air Squadrons. JEFTS as a result was renamed the Defence Elementary Flying Training School in July 2003, with the FAA element re-establishing itself as 703 Naval Air Squadron (703 NAS) and the AAC element as No. 674 Squadron. In November 2009 the Fireflies were retired and replaced with the Grob Tutor T1. Barkston Heath remains a largely unspoilt Second World War airfield. Because the aircraft used are relatively small, the runways have not needed to be lengthened, preserving the wartime layout. Consequently, many of the wartime loop dispersals survive, along with the T-2 hangars. A Grob Prefect T1 trainer aircraft of the type based at RAF Barkston Heath. RAF Barkston Health is home to the Defence Elementary Flying Training School, comprising 703 Naval Air Squadron (703 NAS) and No. 674 Squadron Army Air Corps. Both units operate the Grob Prefect T1 in the elementary flying training role. Aircraft and support are provided by a civilian contractor, Ascent Flight Training, as part of the UK Military Flying Training System contract. Ascent also provides a significant proportion of the instructional staff, an Air Traffic Control service, plus engineering and support personnel. Although the school trains Fleet Air Arm and Army Air Corps crews, it is under the command of the RAF's No. 3 Flying Training School, based at nearby RAF Cranwell. 703 NAS trains future Fleet Air Arm pilots destined to crew both helicopters (AgustaWestland Merlin and AgustaWestland Wildcat) and fast jets (Lockheed Martin F-35B II Lightning and BAE Hawk). Helicopter students graduate to the Defence Helicopter Flying School at RAF Shawbury in Shropshire, whereas fast jet students move onto No. 4 Flying Training School at RAF Valley in Anglesey. 703 NAS also comprises the Observer Training Flight, which provides basic flying and navigation training to FAA observers prior to observer training with 750 NAS at RNAS Culdrose in Cornwall. No. 647 Squadron of the Army Air Corps trains British Army pilots who will go onto the Defence Helicopter Flying School and eventually fly front-line helicopters such as the Boeing Apache and AgustaWestland Wildcat. Barkston Heath acts as a Relief Landing Ground for the flying training activities at RAF Cranwell, which is four minutes flying time away. The following flying units are based at RAF Barkston Heath. The station is also regularly used as relief landing ground by aircraft based at nearby RAF Cranwell. ^ "Defence Estates Development Plan 2009 – Annex A". GOV.UK. Ministry of Defence. 3 July 2009. p. 18. Retrieved 14 April 2019. ^ "UK MIL AIP Barkston Heath" (PDF). UK Military AIP. No.1 Aeronautical Information Documents Unit. 3 January 2019. Retrieved 14 April 2019. ^ March, Peter R. (1998). Brace by Wire to Fly-by-Wire – 80 Years of the Royal Air Force 1918–1988. RAF Fairford: RAF Benevolent Fund Enterprises. p. 164. ISBN 1 899808 06 X. ^ a b "Flight of the Slingsby Firefly". BBC News. 17 November 2009. Retrieved 18 April 2019. ^ a b c "Fleet Air Arm | 703 Naval Air Squadron | Elementary Flying Training". Royal Navy. Retrieved 16 April 2019. ^ "Barkston Heath". Airfields of Britain Conservation Trust. Retrieved 24 February 2017. ^ a b c d "RAF College Cranwell". Royal Air Force. Retrieved 16 April 2019. ^ "Fleet Air Arm | 750 Naval Air Squadron | Observer Training". Royal Navy. Retrieved 16 April 2019. Wikimedia Commons has media related to RAF Barkston Heath.